The Great Hills neighborhood is right next to the Arboretum shopping center, which contains dozens of shops, restaurants and a movie theater. This neighborhood is convenient to downtown yet you still feel like you're out of the hustle and bustle in this scenic part of town. 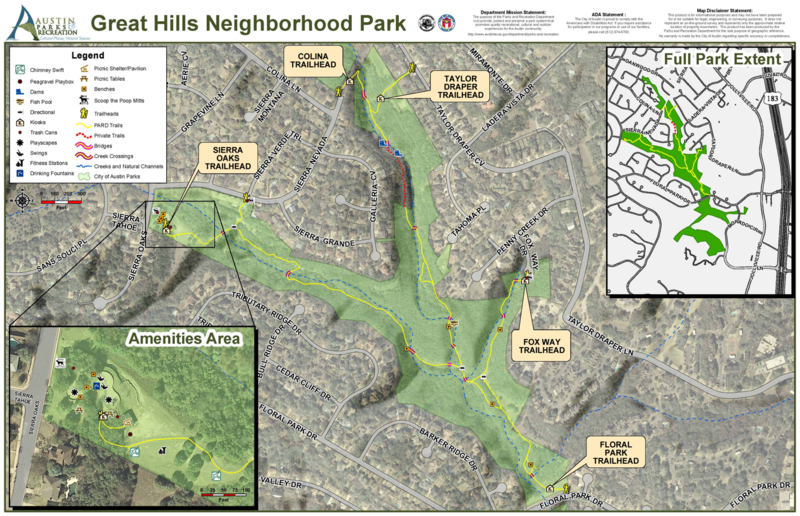 Great Hills Park, including more than 80 acres, is a large natural area with hiking trails, a playscape, a covered pavilion, picnic tables, exercise equipment and much more. Map is below. The average home size for the community is around 3,000 sqft and the average sale price is just over $600,000. The golf course is tough. It takes a little insider knowledge and a some straight shots to conquer this one. There a few blind tee shots but the tree top scenery overlooking the fairways make it worthwhile. This course is not a very walk-able golf course due to it's enormous hills and green to tee distance on the back nine. Save some energy for the par five 18th hole that goes straight uphill. You'll thank me for that.